You have decided that carpet is the best choice for your home now what? your lifestyle. You should ask the following questions to help you decide. • What is the main use for the room(s) going to be? • What kind of traffic do you expect? • Will this room(s) be the center of activity in your home? • Does this room have direct access from outside where you can track dirt in? • Do you have pets and or children? • Am I planning to be in the house for over 10 years? Over 5? Shorter? Longer? • What kind of statement am I trying to make in regards to styling? • Are you more into soft fibers? Or lower profile carpets? Some of the new carpet trends are geared toward tweed colors and subtle patterns. showcase other furnishing but also can bring the focal point to the carpet itself. you the envy of all your neighbors and friends. Why Wait, Give Coventry Carpets a call today! The look and even feel of the best natural materials at a lower price including distressed wood finishes, stone and slate tactile surface textures, and woven textiles imbedded in the wear layers. LVT satisfies Green building standards and earns LEED points for commercial jobs. Meets commercial flammability codes, slip resistant requirement, and an assortment of other safety codes. LVT floors can be cleaned by a simple damp mopping. LVT floors are water resistant. LVY is scratch, stain, dent and scuff resistant. LVT is very durable and is constructed to withstand commercial wear and tear. LVT is ideal for residential high-traffic areas as well as other areas of the home. Warranties vary by manufacturer, but it’s not unusual to see 20-25 year warranties. LVT floors are designed to capture the look of natural stone tile flooring, wood planks and ceramic tile floors, while providing a very durable surface. 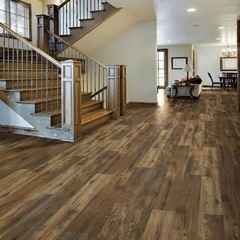 LVT comes in fashionable designs ranging from contemporary to a rustic look. Choosing a flooring company is not just an important economic decision. It can also affect the look, design and functionality of your home. 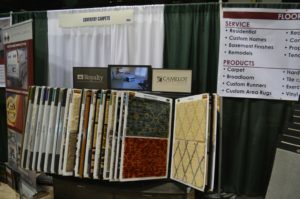 The right flooring company will understand your unique situation, and work with your budget to make the most of your investment. At Coventry Flooring our installers are employees, not sub-contractors. We are one of very few companies that guarantee’s the installation for the life of the carpet because we install it. Our installation crews are all insured and bonded. At Coventry Carpets, we don’t just want to sell you carpet one time, We look forward to servicing you and your family for years to come, that’s why 90% of our business is word of mouth referrals. 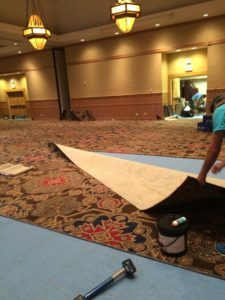 We do our best to fit the correct carpet for the application it is intended to be used for, Our goal is to find a carpet that works best for your family/ office, and not just sell you any ole carpet to get awarded the job.